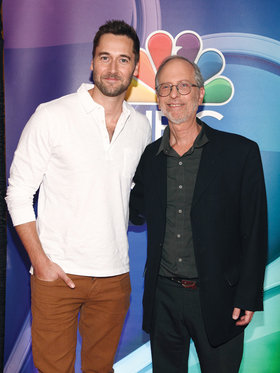 Series star Ryan Eggold, left, and Dr. Eric Manheimer attend NBC's fall New York press junket. One of the new shows debuting on NBC this fall is a drama with a sterling medical background. “New Amsterdam” was inspired by a medical memoir by the former medical director of New York's Bellevue Hospital Center, Dr. Eric Manheimer. His book, Twelve Patients: Life and Death at Bellevue Hospital, was published to critical acclaim in 2012. It explored the world of medicine and healthcare through the stories of a dozen patients who range from an illegal immigrant with terminal cancer to an addicted Wall Street tycoon. One is the author himself, describing his treatment for throat cancer. The TV version, which premiered Sept. 25 and has Manheimer as a producer, isn't attracting quite as much praise. “Less awful than awfully derivative,” ruled the Hollywood Reporter. Less charitably, Vulture chimed in with: “Very, very dumb.” USA Today diagnosed it as “dead on arrival.” So, apparently it won't be challenging “House,” “ER” or “St. Elsewhere” in the pantheon of great TV medical dramas. If you do catch “New Amsterdam,” it stars Ryan Eggold as Dr. Max Goodwin, supposedly modeled on Manheimer, as a new medical director of the titular hospital, determined to shake things up. “Dr. Goodwin must disrupt the status quo and prove he will stop at nothing to breathe new life into this understaffed, underfunded and underappreciated hospital,” according to NBC .